Inspiro was developed by Siemens, in collaboration with Newag of Poland, for the Warsaw Metro. Image courtesy of Siemens. Inspiro features eight large doors on each car with lighted information graphics on them, enabling easy entry and exit. Image courtesy of Siemens. The first ten trains are being built at the Siemens Mobility Plant in Austria, while the remaining trains will be built by Newag at Nowy Sags in Poland. Image courtesy of Siemens. The Inspiro trains feature large displays in the interiors to provide improved passenger information. Image courtesy of Siemens. The trains have cork and rich wood interiors with special facilities for people with restricted mobility. Image courtesy of Siemens. Inspiro is an environment-friendly and cost-efficient metro train model built by Siemens. 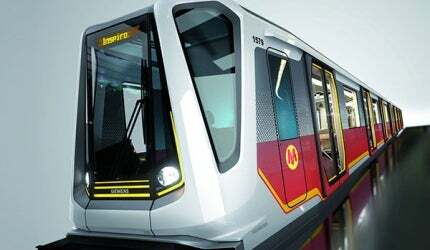 A total of 35 Inspiro trains will be delivered to Warsaw’s metro operator, Metro Warszawskie. The train was developed by Siemens in collaboration with Newag of Poland. It was designed by DesignWorksUSA, a subsidiary of BMW group. "The first Inspiro train for the Warsaw Metro became operational on 1 in October 2013." Metro Warszawskie ordered the trains at a cost of €272m in February 2011. The European Investment Bank (EIB) issued a loan worth €139m ($184m) in late 2012 to fund the acquisition of the new rolling stock. The European Bank for Reconstruction and Development (EBRD) had previously provided a €80.6m ($106.6m) loan in September 2011 for the purchase of new trains for the Warsaw metro line. The first Inspiro train for the Warsaw Metro became operational on 1 in October 2013. The new rolling stock is designed to alleviate road traffic congestion in Warsaw by providing a better alternative and meeting the needs of the metro’s growing passenger traffic. An Inspiro train running on the Warsaw Metro caught fire in November 2013, causing the evacuation of around 200 people and the hospitalisation of eight passengers. Following the incident the trains were removed from service and tests carried out. Siemens has implemented a technical improvement of the train’s current collector fixing mechanism on all vehicles in the existing Warsaw Metro fleet, and will incorporate this into the rest of the vehicles before delivery to Metro Warszawskie. The existing fleet is expected to resume passenger service in the coming days. The Inspiro trains feature a driver’s cab on both ends, enabling them to run in both directions. They also feature Automatic Train Control (ATC) system. The train is 117.8m long and 1,435mm wide, and comprises six cars. The body of the cars is built of aluminium. The front end of the car weighs 500kg, which is less than that of any other normal train. The overall weight of the train is 6t less than that of normal trains. The cars have a width of 2.63m to 3m and a length of 17.9m to 20m. The train has a capacity of accommodating 1,450 passengers, including 256 seats and room to carry 1,194 people standing. Each car has eight large doors and lighted information graphics, enabling easy entry and exit. The expected lifespan of the train is 40 years. The train runs at a maximum speed of 90km/h with the traction system comprising four asynchronous motors per car. It is further fed by a force-ventilated SIBAC series IGBT compact inverter. Part of the axles of the trains is powered by electricity through the 750V DC line using current collectors from the third rail. Inspiro is being constructed using recyclable materials which will have a 95% recycling rate at the end of useful life of the train. The trains are built to conform to European fire protection and crash requirements. The interiors of the train feature no electronics or mechanics lockers in order to provide ample space for passengers. The materials used for the interiors of the train consist of cork and wood. The 340km Warsaw – Gdynia Railway is a major section of the 500km-long E-65 line in pan-European transport corridor VI, which connects the Baltic countries with southern Europe, running from Gdynia, via Warsaw and Vienna, to Rijeka. The handholds in the train are specially designed and shaped like tree branches to be in line with the environmental intent and also provide enough support for the majority of passengers, who will travel standing. Sliding steps are provided at one end of each car for passengers with restricted mobility. The trains operate on an optional driver assistance system, as well as driverless operation and conventional operation systems. The power consumption is minimised by using LED carriage lighting and demand-controlled air-conditioning. Noise generated by the train is reduced by implementing an electrodynamic braking system. The floors are built using recyclable materials such as light textiles and cork-aluminium in order to absorb the sound. The new Inspiro trains run on the Warsaw Metro system, which comprises two lines. Up to 15 trains will run on Line 1 of the metro, while the rest of the trains will run on Line 2. Two Inspiro trains were delivered for testing by the end of 2012. One of these two trains was unveiled at InnoTrans in Berlin in September 2012.